Helios by Metra Home Theater Group offers a broad range of retail AV products designed to provide reliable solutions for today’s 4K / HDR home theater systems. Our expertise and long history of developing home theater products with innovative and proprietary technologies has been applied to our Helios product line, so that end-users can enjoy the ultimate multimedia home theater experience. 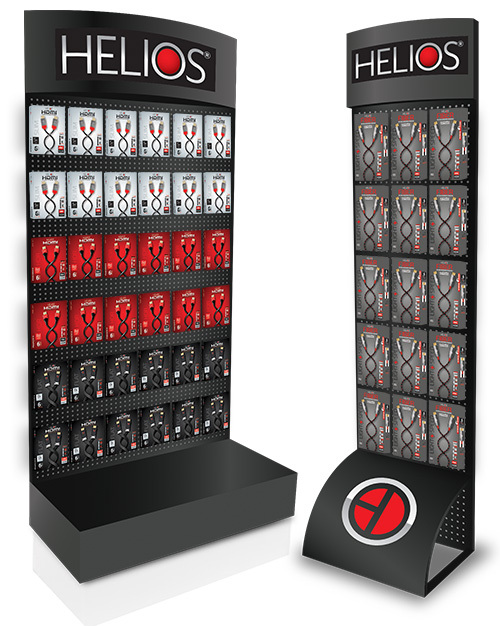 Helios manufactures high quality products that are driven by performance, reliability and affordability. 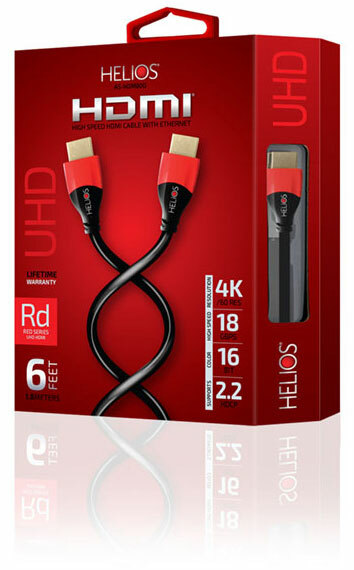 Helios HDMI® cables and AV products come in retail friendly packaging, designed with the consumer in mind. 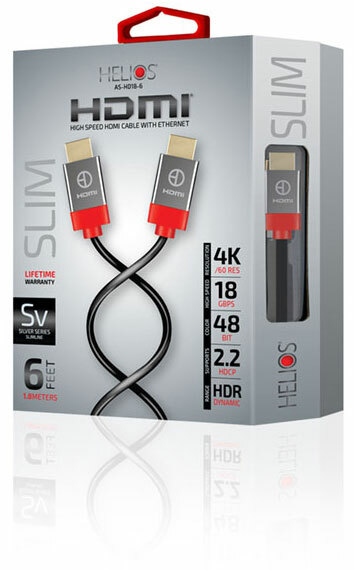 Helios Active Fiber Light Speed HDMI® cables create a whole new level of value and performance with 18Gbps at HDMI 2.0 specifications, providing the fastest HDMI signal! These cables are designed to support 4K and HDR, and also support Ethernet over HDMI for crisp, clear picture quality. An ultra-energy efficient Rx/Tx chipset doesn't require any added external power, allowing for a cleaner and simpler installation. A robust head shell and durable cloth braided jacket protect the cable and its built-in electronics. 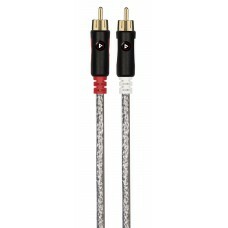 The gold plated connectors will remain free of oxidation and the strong braided cotton outer jacket still provides flexibility for the thin cable, making it easier to install in tight locations. 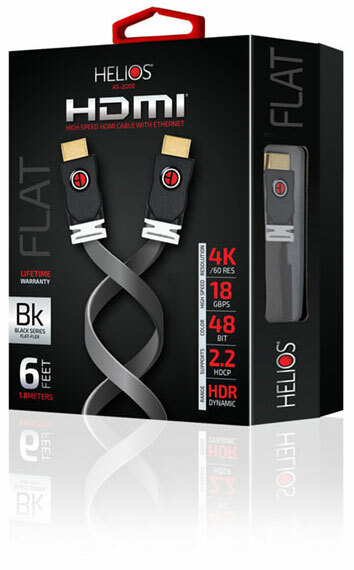 Helios 800 Series HDMI® cables with ethernet offer high-speed performance at a great price, supporting 4K/HDR at 18Gbps up to 12 feet (3.6 meters). They come in a CL rated jacket to provide behind the wall installation at an economical price without compromising video and audio performance. The Helios 800 series cables have an audio return channel, support HDCP 2.2, 4K/60 and come with a lifetime warranty. With the Series 2000, ultra-thin display installations just got easier. 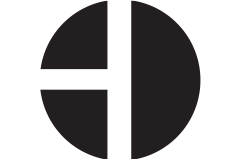 These low profile HDMI® high speed cables are designed for installations in tight spaces. 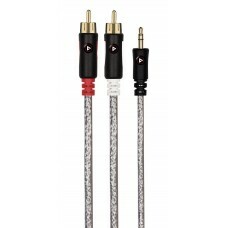 The ultra-flat cable helps create a “hidden-wire” look and features Ethernet and an audio return channel. These cables fully support 4K/HDR at 18Gbps up to 6 feet (1.82 meters) and support 10.2Gbps for cables longer than 6 feet (1.82 meters). The Helios Series 2000 offers a premium quality abrasion resistant cotton braided jacket for maximum durability, as well as low loss foam-skin polyethylene dielectric for maximum signal transfer and superior picture quality. They are shielded to prevent electromagnetic interference and designed for easy installation. The Helios Series 2000 cables meet or exceed all DVI, DDWG, HDCP, HDMI® Workgroup specifications. These cables come with a lifetime warranty. Helios 18 Series HDMI® cables deliver 4K / HDR at 18Gbps for superior high definition picture and sound. They come in a CL rated jacket to provide behind the wall installation at an economical price without compromising video and audio performance. 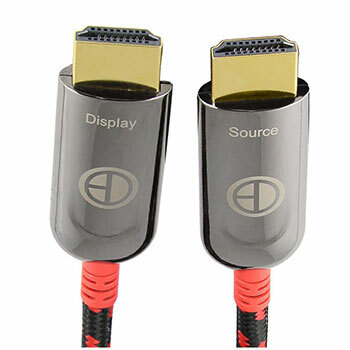 These high-speed cables fully support 4K / 60, 48 bit deep color, and are designed for high-definition connections utilizing displays with 4K/60* capability. Includes an audio return channel. In addition to our broad range of integration solution products, we’ve redesigned and expanded the Helios product line of TV mounts to solve the problems of today’s custom integrators. Our revolutionary TV Audio Mounts combine an easy to install flat panel TV wall mount bracket with an integrated high performance digital audio sound system that looks as good as it sounds, with a simple one-cable connection. 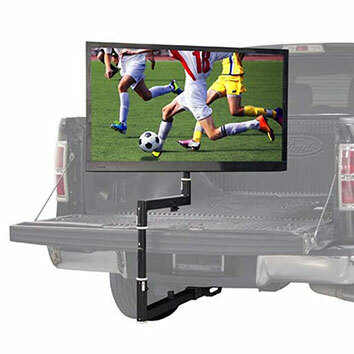 Our specialty mounts include the award-winning TV Tailgate Mount (TGML64) that turns any standard trailer hitch into an instant entertainment center. We’ve also introduced handy time-saving features TV mounts compatible with both 6” and 24” center studs, for more versatile mounting solutions. Our new Full Motion In-Wall TV Mount (FM44IW) is completely recessed and features a sturdy metal box that fits between the studs, to allow for extra room for devices and wires behind the display, allowing the TV to sit flush against the wall. Custom and professional looking POP displays to grab attention.